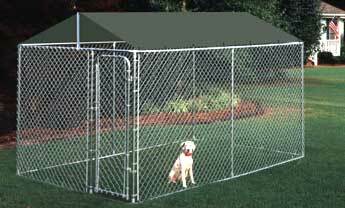 The dog kennel roof helps pets stay cooler, drier, cleaner, healthier, and happier with this steel frame and poly tarp rain cover prepackaged in a box. All components needed for assembly and attachment to kennel, plus step by step instructions included. The Kritterguard 10 x 10 roof tarp is white and the PetSafe 7.5 x 13 roof tarp is green. It is recommended that an anchor kit be used when using a roof system. The roof systems are intended for the kennels we offer. 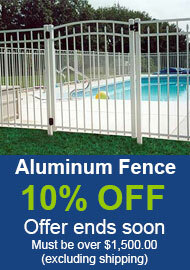 Dog Kennels not included. Manufacturer does not guarantee these dog kennel roof systems in snow or ice under any circumstances. They are not designed to hold the roof loads that accompany snow, water or ice. Make sure the roof tarp does not allow snow, water or ice to accumulate that may collapse the kennel and or roof system. Dog Kennel roofs make excellent kites. If a strong weather front is coming - remove the cover. Perfect choice for dog kennels - roof systems.